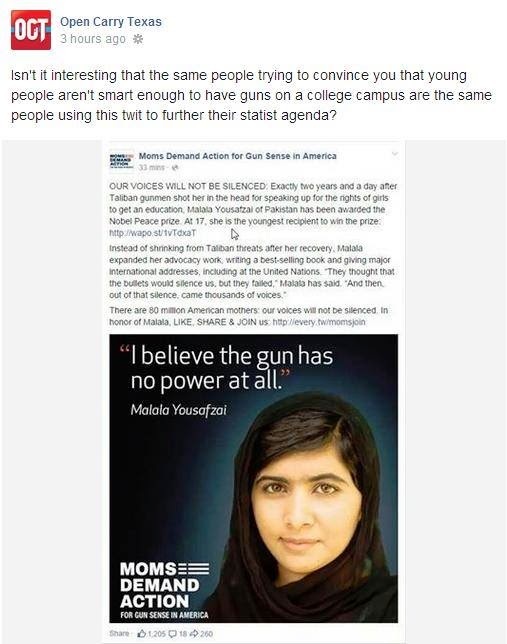 Of course, we have the village idiots trying to persuade people that a young woman who showed bravery and conviction despite being shot has something to do with allowing guns on campus. Additionally, this was a young woman who was deemed worthy of a Nobel Prize. Wow, who is calling whom a twit? You know who else thought she was a "twit"? The Taliban. And Afghanistan was as Stateless as you could get under the Taliban. Trust me, these people aren't the brightest stars in the firmament. Obama winning the Peace Prize so besmirched the thing that, unfortunately, it is absolutely worthless and meaningless. However, you could emulate this girl's psyche towards guns. It would be the right thing to do and then, perhaps, you could move on with your pitiful life. Is your Obama hate so all-encompassing that you actually believe the Nobel Prize is now "absolutely worthless and meaningless?" Let's get something straight, I don't 'hate' anyone. Lets get something else straight, War is NOT Peace and if you give an award to a war criminal it severely diminishes its value and prestige. They may as well given it to Bush or Cheney. Seriously, was there a complete thought in that string of "sentences?" And we're to believe you are a lawyer? Yeah right.